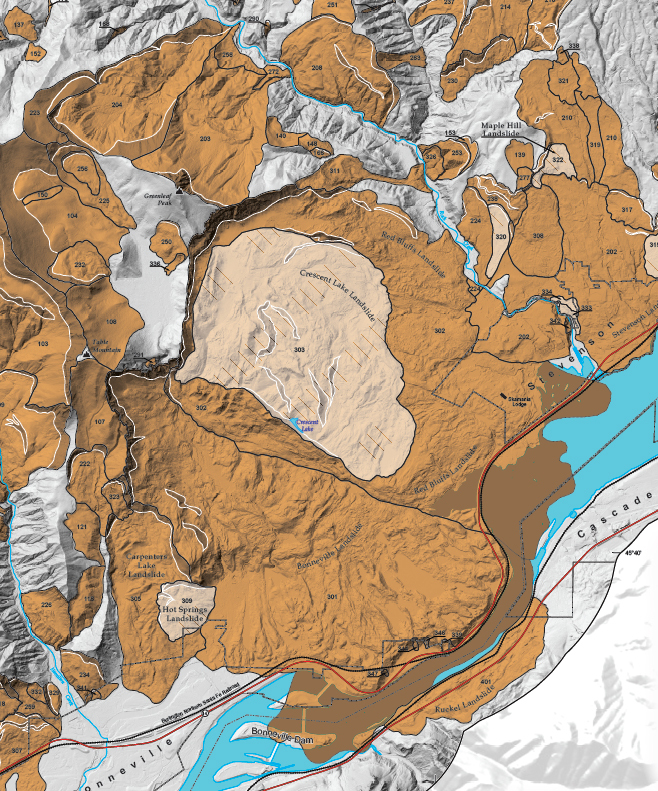 Portion of a landslide map of the western Columbia River Gorge centered on the previously known Cascade landslide complex. Gray areas are presumed stable terrain. Landslides presumed now to be inactive are shown in orange or brown (submerged parts). Active landslides are shown in buff color. Eruptions are not the only hazard created by volcanoes. They can create havoc millions of years after their fires have grown cold, because with time, their deposits can weaken to produce landslides. This happens because volcanic deposits are commonly rich in volcanic glass, a non-crystalline form of silica. In wet climates, this glass can readily transform into soft, weak minerals (primarily clay) through chemical weathering. Both volcanoes and landslides are important for landscape evolution in Hawaii and worldwide. In Washington State, an old legend makes the connection between them. In one version of a legend of the Klickitat people, the chief of all gods (Tyhee Saghalie) and his sons (Pahto and Wy’east) came to the land along the Columbia River and decided to stay, but the sons quarreled over which area each would get. To settle the dispute, the chief sent Pahto to the north side of the river and Wy’east to the south. He then built a great bridge across the river, the Bridge of the Gods, so that the family could continue to meet. But the brothers renewed their quarrel, this time over a beautiful maiden, Loowit. The quarrel escalated. Massive rocks were hurled; the ground shook. Villages were buried, forests were destroyed, and the great bridge collapsed into the river. As punishment, the father turned the angry sons and the maiden into volcanoes—Pahto became Mount Adams, Wy’east became Mount Hood, and Loowit became Mount St. Helens. Geology tells the same story. Northwest Indians really could walk across the Columbia River atop the massive Bonneville landslide, which slid across and dammed the river almost 600 years ago. When the landslide-dammed lake overtopped the blockage, the bridge “collapsed” to form a great rapids—the Cascades of the Columbia. 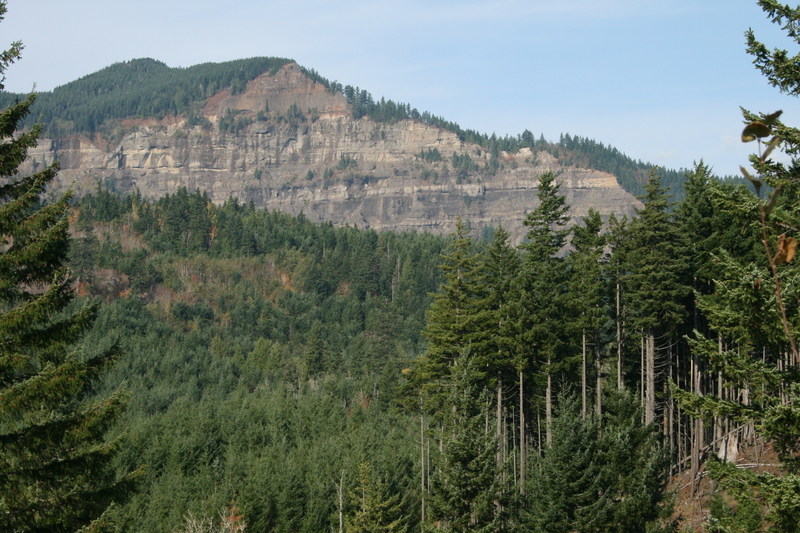 This landslide is part of a legacy left by ancient Cascade volcanoes. Until recently, the extent of this legacy had not been fully appreciated. View of headscarp of Red Bluffs landslide (adjacent to the Bonneville landslide), looking northwest and showing the bedded volcaniclastic sediments (gray layers) that are dipping about 7 degrees toward the viewer and in which sliding has occurred. 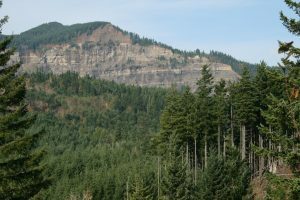 The slightly darker gray and orange-brown unit in the top quarter of the scarp face is Columbia River Basalt. The slowly creeping Crescent Lake landslide, on which the photographer is standing, is a reactivated part of the Red Bluffs landslide. USGS photo by T. Pierson. 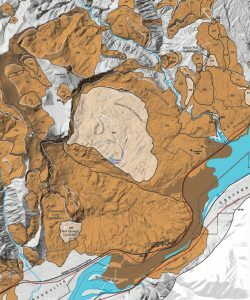 A recently completed USGS study (pubs.er.usgs.gov/publication/s…) mapped and dated many landslides not previously recognized in a rainy corner of the Pacific Northwest—the Columbia River Gorge in Skamania County, Washington. These landslides, formerly hidden by dense forest, occurred over at least tens of thousands of years, and about a dozen are still moving. Their slip planes (sliding surfaces) occur entirely within volcanic deposits laid down by eruptions that occurred about 25 million years ago in the ancestral Cascade Range—deposits from volcanoes that have long since eroded away. Tectonic forces operating over the last few million years have tilted the beds of volcanic deposits southward toward the downcutting Columbia River, which facilitates sliding along weak zones within the weathered, clay-rich sediment beds. The discovery of so many previously unknown landslides was made possible by the availability of three new technologies—LiDAR, GPS, and InSAR, which were essential for this project. The discovery of these landslides has implications for hazards today. The Bonneville landslide has a volume of about 1 cubic kilometer (think of a box a half a mile wide, long, and high) and runout distance of about 6 km (3.7 mi). Another such large landslide rapidly sliding into the Columbia River today could have a catastrophic impact on downstream communities and on the transportation and energy-distribution infrastructure of the Pacific Northwest.